Then-Rep. Brian Calley attended when Democratic Gov. Jennifer Granholm signed the divisive Michigan Business Tax into law in 2007. Lt. Gov. Brian Calley is running for governor to continue the economic comeback that he says Gov. Rick Snyder’s administration started. The Republican from Ionia County is running on the Snyder administration’s record to appeal to voters who have supported the governor’s tax and economic growth policies. Calley’s website touts his accomplishments, citing several instances where he said he played a leading role in tax reform. Snyder is backing his No. 2 over the generally acknowledged GOP front-runner, state Attorney General Bill Schuette — who has had a contentious relationship with the governor. But how much credit can a lieutenant governor rightfully claim for a governor’s political wins? Michigan does rank 12th in overall business tax climate and eighth for corporate taxes on this year’s State Business Tax Climate Index from the Tax Foundation, a right-of-center Washington, D.C.-based think tank. The Tax Foundation ranked Michigan 49th for corporate taxes in its 2012 ranking — which covered the 2011 tax year, after the state’s business tax changes were adopted but before they went into effect, a Tax Foundation senior policy analyst told Truth Squad via email. However, the state’s overall business tax climate ranking in 2012 was 18th, not 40th, according to the Tax Foundation. The organization said it could not find a record of a year in which Michigan ranked 40th in overall business tax climate. When asked to provide an explanation for the 40th ranking, the Calley campaign shared a link to a 2008 CNBC ranking of states on business metrics, in which Michigan was 40th. On the tax reform issue, as lieutenant governor Calley is president of the Michigan Senate and is able to vote in the event of a tie. He did just that in May 2011, when the Senate deadlocked, 19-19, on a bill that included creating a new flat corporate income tax. Lt. Gov. Brian Calley stands alongside Gov. 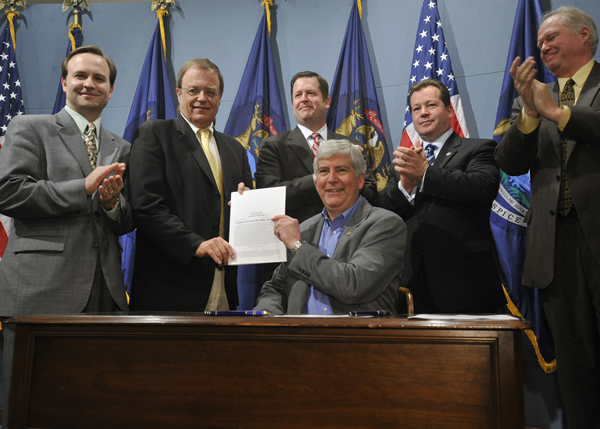 Rick Snyder in May 2011 after he signed legislation to repeal the Michigan Business Tax and replace it with a flat corporate income tax. What Calley and his campaign do not mention, however, is that he was for the MBT before he was against it. Calley was among lawmakers who helped write the business tax in 2007 when he was a first-term state representative. He was named to a conference committee of six legislators that crafted the version of the MBT language that ultimately was adopted. He even attended the bill signing with then-Gov. Jennifer Granholm, a Democrat. Calley told Truth Squad that his role in the legislation that created the MBT was to lower an alternative rate to the MBT paid by small businesses, and increase the number of small businesses that qualified for the alternative rate. In other words, he says his participation helped keep a bad bill from being worse. Quantifying the influence that a No. 2 public official has on the policy wins of the top dog is inherently difficult. Calley seeks to ride the victories of the Snyder administration and the outgoing governor is happy to abet that effort to help boost Calley’s campaign. But in latching onto the state’s very real economic recovery since Snyder took office, Calley offers truths interspersed with mistruths, while leaving out important details that could easily mislead voters who didn’t know the full story of Calley’s work in Lansing. His campaign’s use of different data sources to show improvement in the state’s business climate is deceptive and also puzzling, given Michigan’s very real gains on this metric. And in latching onto whatever role he played in eliminating the MBT, he failed to note his own role in helping to create the despised tax, a history that voters are entitled to consider when picking the next governor. While it is somewhat interesting to learn about the details of Calley's statements regarding a claimed economic victory, I think the real story here is that while there has been an improved climate for businesses in Michigan during this Governor's term, it has been at the expense of residents, municipalities, schools and more. Where is the recovery for the people of Michigan and the services we need, compared to the recovery of corporations? That is a story I would like to read. “...cast the deciding vote on the budget and tax reform in 2011..."
Was that the vote that gave us the pension tax and locked in the Michigan Income Tax Rate at 4.25% (instead of lowering it as the law was originally written)? Wasn't Calley the guy who cast the tie-breaking vote on Snydercaid? Didn't he support the Detroit bailout? And didn't he also cast the deciding vote on the gas tax hike that got nuked at the ballot? LG Calley certainly has an interesting perspective on boosting Michigan's economy. I cannot wait for his campaign to spectacularly crash and burn when he tries to sell his record to Michigan Taxpayers. Taking credit or affixing blame for the economy is dicey at best but it never stopped politicians from doing it when it suits. While some actions may well help in some way for the short/mid term, many times things are just normal economic variations. Unfortunately as long as voters are susceptible to accusations or credit taking you can expect them to continue to be used. If the economy was heading south the Dem's wouldn't be heaping blame on Calley? Perhaps more useful for voters would be to look at the connection between high rankings in the Tax Foundation business climate list and per capita income, the best measure of a state's (and persons) prosperity. There is none. Actually, by and large, the better your business tax rating, the poorer your state is. Indiana has a high Tax Foundation ranking. It's the poorest state in the Midwest (just nicking out Michigan, which has the second highest Midwest business climate ranking.) Minnesota has a terrible Tax Foundation ranking. It's per capita income is the highest in the Midwest, thousands of dollars above Indiana and Michigan. Why do you want to win a ranking that makes your people poor? I'm baffled.